When Joseph Rotunda, Texas’s lead securities law enforcer, first heard the term “ICO” a year ago, he thought it was just another acronym he’d have to memorize. Little did he know those three letters would become a major focus of his agency’s enforcement efforts. 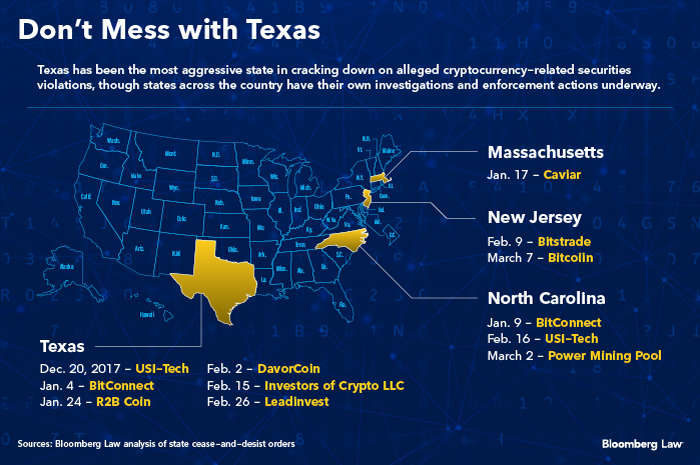 Texas has emerged as the most active state in cracking down on alleged scams touting ICOs, short for initial coin offerings, as well as other securities violations involving cryptocurrencies. Securities regulators in other states aren’t far behind. Many are devoting significant resources to investigating cryptocurrency fraud, state securities officials told Bloomberg Law in a series of interviews. “We see a lot of fraud in Texas,” said Rotunda, who has served as Enforcement Director at the Texas State Securities Board since 2007. Lone Star state regulators were more accustomed to cracking down on fraudulent oil and gas projects or investment fraud like promissory notes targeting senior citizens. That changed as the price of bitcoin skyrocketed in 2017, Rotunda said. Bitcoin’s price rose from less than $1,000 at the beginning of that year to a high of more than $19,700 in December. Globally, ICOs raised more than $6 billion in 2017, with some legitimate companies’ offerings bringing in millions of dollars in a matter of minutes. But the frenzied ICO market also saw an influx of boosters, con artists and investors looking for quick returns, all setting regulators on edge. Texas was the first to act, tipping off a sweep of enforcement activity in multiple states. On Dec. 20, the securities board issued an emergency cease-and-desist order against USI-Tech, which it alleged violated securities laws by promising low-risk, 150 percent returns from investments related to bitcoin mining. Neither the investment nor its agents were registered in Texas, the order said. On Jan. 4, Texas filed its first ICO-related cease-and-desist order against BitConnect. The company claimed its proprietary cryptocurrency’s market cap was worth $4.1 billion. North Carolina followed suit with its own BitConnect cease-and-desist order on Jan. 9, just a day before the company was slated to launch its latest ICO. BitConnect is facing multiple class action lawsuits from investors. Texas, Massachusetts, New Jersey, and North Carolina have issued a dozen ICO- or cryptocurrency-related cease-and-desist orders, most recently from New Jersey on March 9, according to Bloomberg Law’s ICO Developments Tracker. All of the orders allege various violations of securities laws. The orders are the first wave in what’s likely to be an incoming tide of state enforcement action. 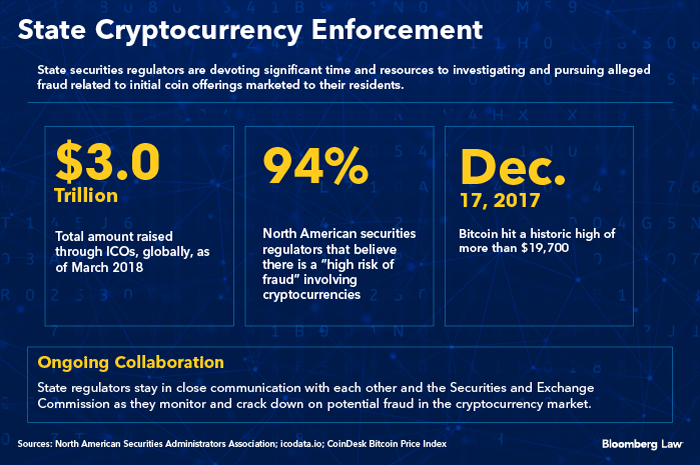 A recent survey by the North American Securities Administrators Association found 94 percent of regulators believe there is a “high risk of fraud” involving cryptocurrencies. “It’s right at the top of the list for us as far as concerns with how some of the cryptocurrencies and ICOs are being pitched to some in our state,” Utah’s Division of Securities Director Keith Woodwell told Bloomberg Law. Woodwell serves as NASAA’s Enforcement Section chairman. Utah has 11 investigators and examiners working ICO cases, some of which may lead to criminal referrals, including investigations into licensed broker dealers and investment advisers, Woodwell said. “We’ve gotten quite busy with these types of cases just within the last several months,” he said. A task force of Massachusetts securities staff has opened inquiries or investigations into nearly two dozen unregistered ICOs, Secretary of the Commonwealth of Massachusetts William Galvin told Bloomberg Law by e-mail. On Jan. 17, the state issued a cease-and-desist order against Caviar, a Cayman Islands-registered company, and its CEO, Kirill Bensonoff, a Massachusetts resident. The state’s securities division alleged the company was promoting the sale of an unregistered security, “caviar tokens,” through an ICO to U.S. residents. “My office intends to take swift steps to halt any fraudulent or unregistered securities offerings in or directed to Massachusetts,” Galvin said. The department has about eight people working on cryptocurrency-related issues, though not full time. That includes three people in both the securities and banking divisions as well as a couple of lawyers. “If we can stay on top of it and try to monitor the activity on the front end, particularly when it’s something like this that’s happening so fast, I think that’s a better approach,” Pieciak said. State regulators also said they are in close contact with the Securities and Exchange Commission. The SEC has brought more than a half-dozen cryptocurrency-related actions against companies since a foundational 2017 investigative report relaying the commission’s thinking on ICOs. The agency used the report to warn market participants after it determined some crypto tokens were subject to securities laws, with all of the reporting requirements and registrations that those entail. The commission’s work has led to emergency asset freezes for an ICO that allegedly promised investors a 13-fold profit in less than a month and another one that purportedly secured $600 million and an endorsement from former World Heavyweight boxing champion Evander Holyfield, among other actions. More cases likely are on the way. The commission has sent a “number of subpoenas” to firms it thinks are violating securities laws through their involvement in ICOs, Bloomberg News recently reported. SEC Enforcement Division Co-Director Stephanie Avakian confirmed March 15 the agency has “dozens” of investigations open in the cryptocurrency space. The states are in discussion with the SEC on how to assist with those investigations, Alabama Securities Commission Director and NASAA President Joseph Borg told Bloomberg Law. As federal-level investigations continue to percolate down to the state level, “you’ll see more and more interest by various states. If they’re big enough, there may even be multi-jurisdictional-type examinations or enforcement actions,” Borg said. State regulators said they have good relationships with the SEC, which commended NASAA in January for an effort to remind investors to be cautious of ICOs. SEC Commissioner Michael Piwowar, a Republican, told Bloomberg Law the agency works “hand in hand” with state regulators on ICO matters.